1. System search now includes spark lines to make your life easier when browsing through the systems page. 2. Trading privileges verification no more requires closing a trade; it’s enough to open a pending order, which you may cancel after the trading privileges have been successfully verified. We’ve also tested, fixed and made our website fully compatible with the Opera browser. As always, several other bugs which were reported during the week, were fixed. We’re working on a lot of new and exciting features, so stay tuned! Well, it’s been a really stressful week for our servers! We didn’t expect such a quick growth in such a short period of time, which resulted in slow browsing and delayed account processing. We’re glad to say that we’ve successfully added additional servers during the weekend, which should eliminate the load. Just to give you an idea, our servers process over 8000 trading accounts! 1. The ability to save an image for each of your trades in the history, allowing you to keep an exact record as to why did you enter, exit, lose or profit on a particular trade. 2. Multi-portfolios – We’re aware that most users have multiple demo/real accounts and it’s hard to keep track of all of them. Now you can group your accounts into specific groups, for example demo and real. Once you create and move an account to a specific portfolio, you will see the group in your portfolio menu, giving you a quick access to your accounts. (After adding a portfolio, click the ‘Back to Accounts’ button and use the new combo to assign an account to a specific portfolio). We always receive the same question – what are widgets and how do I use them? So today we’ve decided to dedicate a blog post regarding this matter (with some new features of course!). Widgets are just another way of advertising your trading system, either you’re posting in a forum (forum post/signature, use the BB code) , your blog (Html code), or your own website (Html Code). An important thing to note is that even though the widgets are images, the widgets are dynamic and update as soon as your trading data is updated at Myfxbook. So once you post the widget, the data in the widget will always be up to date with the most recent data, with no need to re-post results or manually post updates. We’ve redesigned the widgets page a bit to make it easier to use and with some new options (ability to link directly to your statements or your member page), you will also see the widgets link in your right upper panel after logging in. 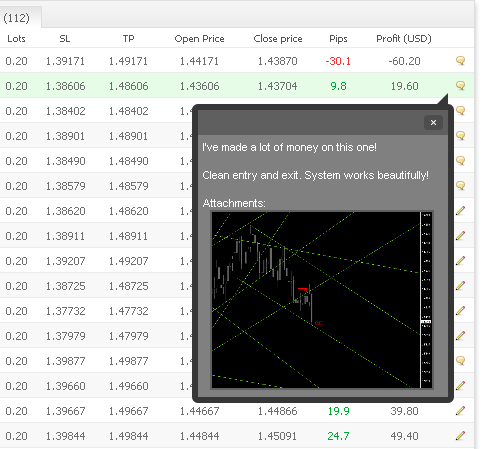 As you can notice in the images, the new widgets show the results as verified by Myfxbook. Obviously, only fully verified accounts will include the “Verified by Myfxbook.com” statement; non verified accounts will only state “Myfxbook.com”. We’ve also changed the limitation of the widgets to show only in public accounts – if you don’t want to make your account public but still want to use our widgets, it’s now possible. Please note that in such case the widget will be static and will not update the data. You can now set your timezone, so all of the website’s timestamps are synced to your local time (including news and economic calendar; statements and trading activity are in GMT as this is the timezone our systems use to perform the calculations). Also, we had a minor issue with the PDF statement not being created properly on Internet Explorer 8 – it is now fixed. We hope you enjoyed the holidays – we know we did! Today we release another feature – the track list. You now know who’s exactly tracking your and other’s systems. Thanks for the members who suggested it! Posted in Myfxbook Updates | Comments Off on So Who's Watching Me? You are currently browsing the The Myfxbook Blog blog archives for January, 2010.